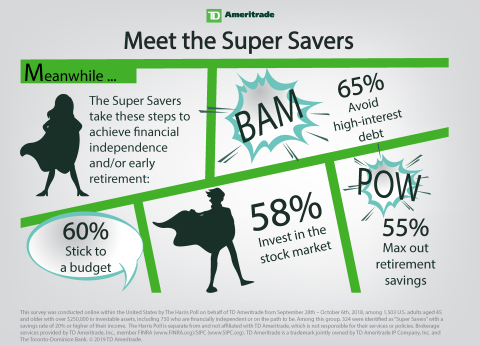 Against these dismal statistics, a recent survey conducted for TD Ameritrade uncovered a group of “Super Savers” – Americans whose savings rate tops 20 percent – and revealed just how dramatically their saving and spending behaviors differ from the norm. Starting young is a key component of super savers’ investment strategies. More than half (54 percent) began investing by age 30, compared to 39 percent of other respondents, with three in 10 starting by age 25, compared to two in 10 of their non-super saver counterparts. Just four percent say they don’t invest at all, compared to 23 percent of non-super savers. Fifty-seven percent of super savers say they either have retired or plan to retire earlier than their parents did, compared to 46 percent of non-super savers. Super savers are spending less than non-super savers in nearly every category, with the biggest differences being in housing (14 percent versus 23 percent of income) and household expenses (16 percent versus 21 percent of income). Despite these differences, both of the cohorts allocate the same percentage of their income to traveling (7 percent). Carefully consider the investment objectives, risks, charges and expenses before investing. A prospectus, obtained by calling 800-669-3900, contains this and other important information about an investment company. Read carefully before investing. ETFs can entail risks similar to direct stock ownership, including market, sector, or industry risks. Some ETFs may involve international risk, currency risk, commodity risk, leverage risk, credit risk and interest rate risk. Trading prices may not reflect the net asset value of the underlying securities. Commission fees typically apply. TD Ameritrade provides investing services and education to more than 11 million client accounts totaling approximately $1.2 trillion in assets, and custodial services to more than 7,000 registered investment advisors. We are a leader in U.S. retail trading, executing an average of approximately 900,000 trades per day for our clients, more than a quarter of which come from mobile devices. We have a proud history of innovation, dating back to our start in 1975, and today our team of 10,000-strong is committed to carrying it forward. Together, we are leveraging the latest in cutting edge technologies and one-on-one client care to transform lives, and investing, for the better. Learn more by visiting TD Ameritrade’s newsroom at www.amtd.com, or read our stories at Fresh Accounts. The Harris Poll is one of the longest-running surveys in the U.S., tracking public opinion, motivations and social sentiment since 1963. It is now part of Harris Insights & Analytics, a global consulting and market research firm that strives to reveal the authentic values of modern society to inspire leaders to create a better tomorrow. We work with clients in three primary areas; building twenty-first-century corporate reputation, crafting brand strategy and performance tracking, and earning organic media through public relations research. Our mission is to provide insights and advisory to help leaders make the best decisions possible. The Harris Poll is separate from and not affiliated with TD Ameritrade, which is not responsible for their services or policies. This survey was conducted online within the United States by The Harris Poll on behalf of TD Ameritrade from September 28 - October 6, 2018, among 1,503 U.S. adults aged 45 and older with over $250,000 in investable assets. Among this group, 324 were identified as “Super Savers” with a savings rate of 20 percent or higher of their income. New TD Ameritrade survey examines the financial habits of those with a 20+ percent savings rate.